I had been craving a good pasta dish. We hadn’t had pasta in a while, which is very unusual for us. I love pasta and could probably eat it even more than I already do 🙂 I had been wanting to try this dish for a long time, and I decided to finally go ahead and make it. We really liked this meal. 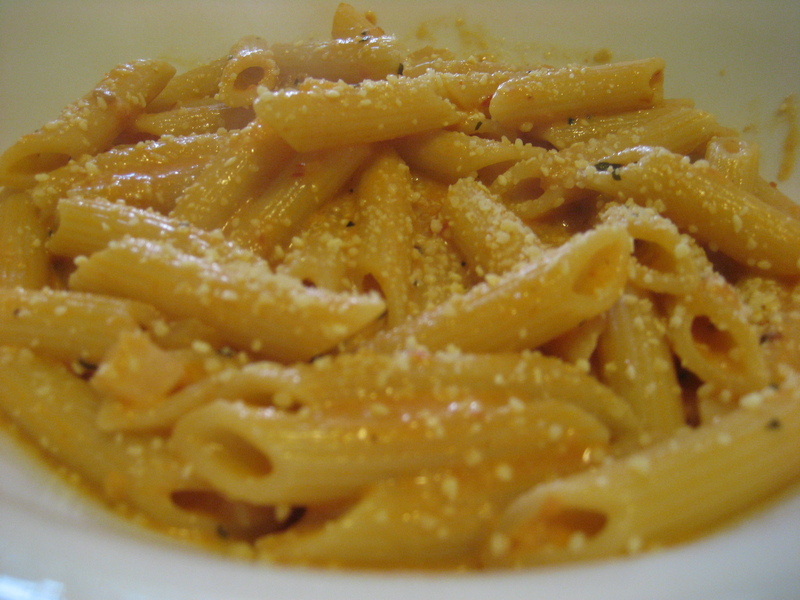 It was very similar to Penne a la Betsy, which we both enjoyed not too long ago. I really like cream and tomato sauces, and this one was perfect. Sometimes sauces have too much cream and not enough tomato, or vice versa, but this sauce had a perfect balance between the two. The red pepper flakes gave the sauce the perfect amount of flavor. The only thing I would do differently is cut back on the onions just a bit because there was just a little bit too much in there. Other than that, this was a great dinner that I would definitely make again. Puree half of tomatoes in food processor until smooth. Dice remaining tomatoes into 1/2-inch pieces, discarding cores. Combine pureed and diced tomatoes in liquid measuring cup (you should have about 1 2/3 cups). Add reserved liquid to equal 2 cups. Heat oil in large saucepan over medium heat until shimmering. Add onion and tomato paste and cook, stirring occasionally, until onions are light golden around edges, about 3 minutes. Add garlic and pepper flakes; cook, stirring constantly, until fragrant, about 30 seconds. Stir in tomatoes and 1/2 teaspoon salt. Remove pan from heat and add vodka. Return pan to medium-high heat and simmer briskly until alcohol flavor is cooked off, 8 to 10 minutes; stir frequently and lower heat to medium if simmering becomes too vigorous. Stir in cream and cook until hot, about 1 minute. Meanwhile, bring 4 quarts water to boil in large Dutch oven over high heat. Add 1 tablespoon salt and pasta. Cook until just shy of al dente, then drain pasta, reserving 1/4 cup cooking water, and transfer pasta back to Dutch oven. Add sauce to pasta and toss over medium heat until pasta absorbs some of sauce, 1 to 2 minutes, adding reserved cooking water if sauce is too thick. Stir in basil and adjust seasoning with salt. Divide among pasta bowls and serve immediately, passing Parmesan separately. I really like this recipe too. It’s actually my back-up meal for when I don’t have anything else planned, because I almost always have all the ingredients (except for the basil, which I don’t worry about). I’m generally too lazy to process the tomatoes until they’re smooth, so I just put some scissors in the can and chop them up a bit. I love Penne alla Vodka but haven’t tried the CI recipe. Thanks! That looks delicious! Great recipe! Vodka/tomato/cream sauce is one of our favorites. I’ll have to dig out my CI issue and give it a try. Thanks for posting — it’s a good reminder. Yum that looks good! I’ve never made vodka penne before but it’s on my list of things to try! I just made this for dinner last night. I was WONDERFUL! So easy! Thanks for the recipe!